Not every Royal Enfield motorcycle sells quickly. Some used motorcycles stay listed on this blog so long they seem like old friends. It's always exciting to hear one of the nice looking bikes has found a home. "Hey, David, I just wanted to thank you for a couple of things. No. 1, thanks for the great blog. I check it out every day, for interesting stories, pix, tips, sales, info, etc. Always informative and entertaining. No. 2, thanks for listing the Peacock Blue Enfield Deluxe, from CraigsList in New Orleans. "I watched the price go down $500 at a time, from $3,500, $3,000, $2,500, $2,000, then $1,800. I called him, he sent me some pix, and I pulled the trigger. "She needs a little work, but she starts on the first kick, most days." 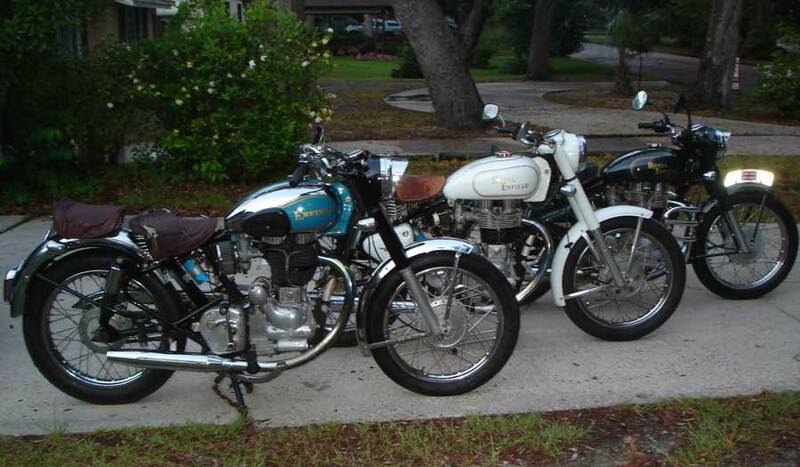 Intriguingly, Matt added: "I'll send you some pix of my Enfields soon." Plural? He has more than one? Sure enough, a picture of three Royal Enfield Bullets, including the Peacock Blue number, arrived in my email. "Lately I've rekindled my love of British motorcycles. After growing up with BSA, Triumph and Norton bikes in the '60s and '70s, and having owned a '73 Harley-Davidson Sprint Single, I've found the motorcycles that I never knew that I always wanted: The Royal Enfield Bullet, the longest running, continually produced motorcycle in the world, in business since 1893, 10 years before Harley-Davidson. My three Bullets were designed in 1939, upgraded in 1955, and virtually untouched by technology." 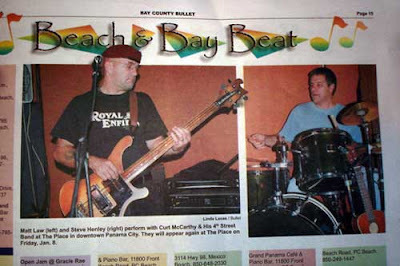 Matt posted a photo of himself playing, from the Bay County Bullet newspaper (yes, there really is a newspaper named the Bay County Bullet). Matt also wrote his own caption: "What the well dressed bass player is wearing these days: 1976 Rickenbacker 4001 Fretless bass, trusty Royal Enfield shirt and West German Fallschirmjäger (paratrooper, literally "fall-fight-hunter") beret, with a badge from Her Majesty's (Elizabeth the Second) Royal Corps Of Transport." Thanks,David! I'm also on FACEBOOK...check it out...and...Happy Motoring,fellow Bulleteers!